We have some really exciting news to share with you! Beginning this fall, four members of the Aquascape team will appear in the new POND STARS TV series on Nat Geo WILD, premiering Tuesday, September 9th at 10 PM ET/PT. You’ll be able to watch from the comfort of your home as some of the world’s best pond builders turn barren plots into beautiful and inspiring aquatic ecosystems. From the wetlands of Northern Florida to the mountains surrounding California’s San Gabriel Valley, Nat Geo WILD’s latest series introduces you to a new type of behind-the-scenes adventure and a number of furry, feathered and scaled critters. 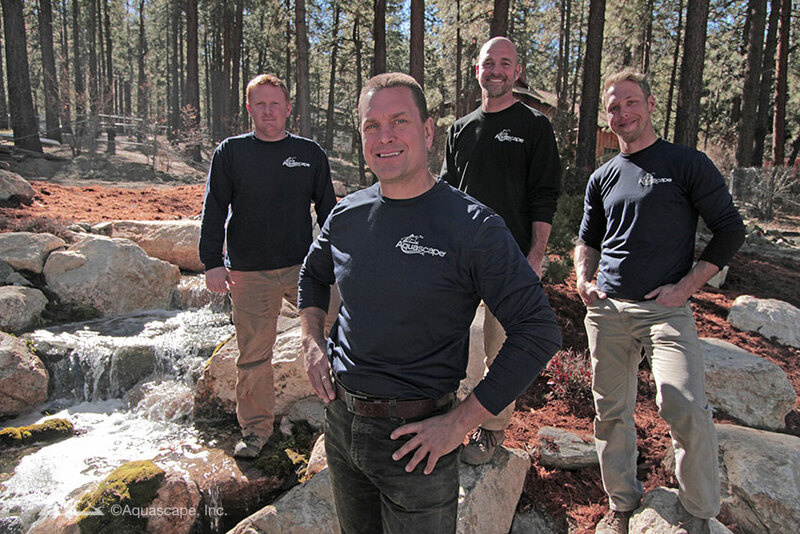 Led by longtime pond expert Greg Wittstock, or “The Boss,” the team uses its unique expertise and appreciation for the outdoors to tackle these challenging assignments. Wittstock, who has successfully developed a childhood hobby into Chicago-based Aquascape Inc. – North America’s leading supplier of water gardening supplies – is joined by co-workers and outdoor enthusiasts Ed Beaulieu (“The Scientist”), Brian Helfrich (“The Foreman”) and Chris Hanson (“The New Guy”). Together, the team presents more than 75 years of experience in the business, having spent decades both training and educating on backyard redesign. Each team member brings a distinct expertise and personality to the series’ transformations and plays a pivotal role in reconnecting clients with the nature around them. We hope you’ll join us in watching the Pond Stars which premieres Tuesday, September 9, 2014 at 10 p.m. EDT / 7 p.m. PDT.